Malaysian Bar president George Varughese has described the change in format to only allow Chief Justice Md Raus Sharif to deliver his speech at the opening of the legal year tomorrow, as tantamount to muzzling the Bar. Varughese, in his speech at the Bar Council dinner tonight in conjunction with the opening of the legal year, said the opening of the event to be held at the Putrajaya International Convention Centre, has always involved three parties – the court, the Attorney- General’s Chambers and the Malaysian Bar. “Since its inception in 2010, the legal year has always, in addition to the speech from the CJ, also included a speech from the attorney-general or his representative, and a speech from the president of the Malaysian Bar, as equal partners in the administration of justice. Varughese said this year, however, the Bar was informed that at the legal year opening tomorrow, only Justice Raus (photo) will be giving a speech. “This change in format - from three speeches to one speech - diminishes the involvement and role of the Bar in the legal year. Had we taken part, we would be little more than invited guests. This amounts to a muzzling of the Bar and raises the question of whether this change in format is a result of some concern about what the Bar would say,” he added. “In view of this change in format, the Bar Council after much deliberation decided to decline the invitation from the court to participate in the legal year 2018. We have notified the court of our decision and conveyed our hope that the format of next year's legal year, will once again include speeches by the AG or his or her representative, and the president of the Malaysian Bar,” said Varughese. 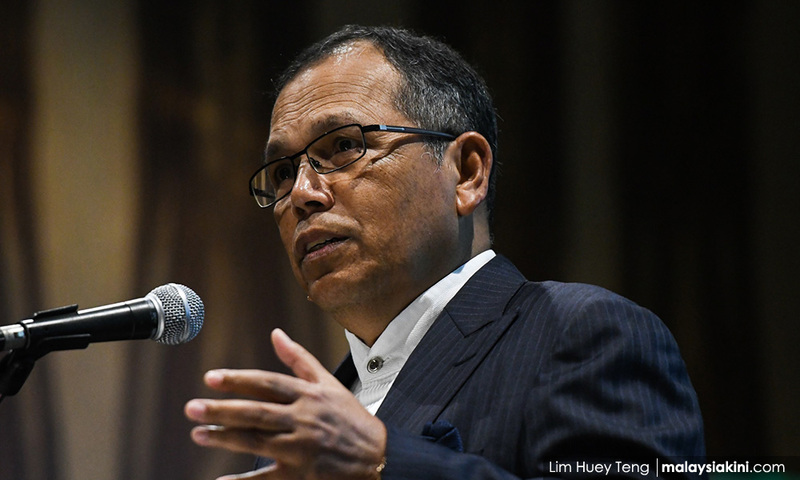 Malaysiakini reported on Wednesday on the change in format for the event which has raised concern and reported that office bearers of the Bar Council will decline invitation tomorrow. Justice Raus, in an exclusive interview with Utusan Malaysia today, explained the reason for the change in format arising from the Bar questioning his appointment and extension as CJ which they wanted to raise in tomorrow's speech. “I think this is unwise for the Bar Council to raise the issue in such an event as they had brought (the issue of my extension) to court. I implore them (meminta jasa baik mereka) not to bring up the issue. “They declined and I decided to change the format of this year's legal year,” he was quoted by Utusan, adding that the Bar's non-attendence would not affect the launch as traditions can change. Varughese, in his speech, further questioned the appointments of Justice Raus and Court of Appeal president Justice Zulkefli Ahmad Makinudin beyond the constitutional retirement age of 66 years and six months. He said the Bar took the unprecedented course of action to file the challenge to the office of the CJ and the president of the CoA as they are leaders of the judicial branch of the government, entrusted with the supreme duty of determining the constitutionality of laws passed by the legislature and the legality of decisions made by the executive. “The unconstitutionality of the appointments calls into question any orders or judgments that may be made by panels consisting of both the CJ and the President of the CoA and this is the antithesis of their solemn oaths of office and allegiance in pledging to “bear true faith and allegiance to Malaysia, and […] preserve, protect and defend its Constitution”. “The said unconstitutional appointments have resulted in a severe erosion of confidence of a large section of the public in the judiciary, and invite an adverse perception as to its independence and integrity. “The vital nature of the roles and duties of the CJ and the president of the CoA under the Federal Constitution requires the circumstances of their appointments to be beyond any controversy,” he stated. Finally, Prime Minister Najib Abdul Razak acted unconstitutionally, in relying on an erroneous interpretation of the Constitution in advising the Yang di-Pertuan Agong that the current CJ and the current president of the CoA appointed purportedly as additional judges in the Federal Court, may continue to hold their positions beyond the constitutionally prescribed age limit.